BREAKING NEWS!!! San Diego Unified Admin Survey Says: Marten Mismanagement Breaking the Backs of Principals/VP/Central Office Mgrs. with “Completely Unreasonable” Workload – SURVEY RESULTS ENCLOSED!!! 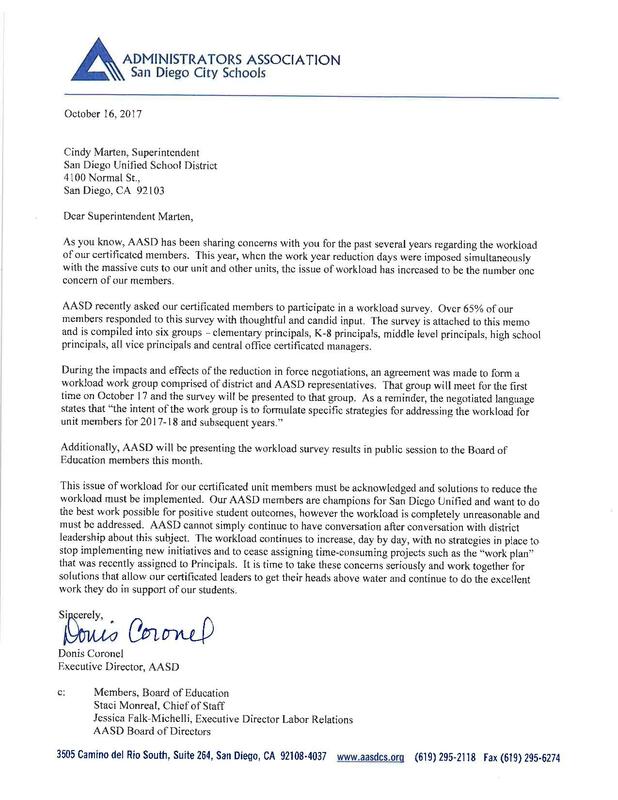 San Diego Unified School District (SDUSD) Principals, Vice-Principals and Central Office Managers were surveyed regarding their workload for the 2017/18 school year- 65% of them responded and the results are alarming. 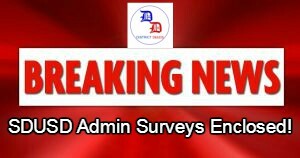 We encourage our readers to review ALL the survey responses. The surveys basically are a combination of “1-5” ratings, multiple chopice and narrative responses. Communications support gets a 1 or 2 from over 59% of Elementary School Principals, over 42% of Middle School Principals and over 52% of High School Principals. Lack of front office staff (Vacancies unfilled.) Meetings that are not connected to the work that needs to be performed at the school. Related to above, inability to get maintenance/repair work done. Lack of timely (or any) training for new classified employees, which leaves principals to locate someone to pay to train new employees. Promotion of inexperienced and underprepared employees into positions of leadership for which they are not prepared. Being smart and skilled does not make up for lack of experience. This practice affects everyone in the district causing a chain reaction; lack of progress and oftentimes chaos in the programs/schools they are assigned, a need to “mentor” to help them get the experiences that they already should have; peers extend themselves trying to assist (when they don’t have the time), it sets a smart and competent employee up for failure simply due to lack of experience. We have over 250 IEP students, many with very high acuity and only have a nurse on site for three of the five days of the week. This has resulted in two 911 calls in the first two weeks of School and requires administration to manage crisis situations above and beyond our training. — We are missing eleven para support providers requiring a daily shuffling of substitutes and or unfilled positions. This causes IEPs to be out of compliance — We have lost nearly 50 students due to transportation issues caused by the SERP and budget crisis. As a school that relies on bussing for its student population, this has caused countless hours of struggle and stress trying to accommodate the needs of so many parents and students — As a specialty school, we do not operate in the traditional cookie cutter formula of other schools. We require by our special status, special consideration with regard to staffing and key personnel in order to effectively run our site programs. These positions have either never been funded or have been cut in funding so that we cannot do the job we were created to do. — The stress and strain of having to take on so many roles as an administrator and to overcome so many support service being cut (both on site and at Central Office) make doing this job virtually impossible to do well and to give the students the support they deserve. STAFFING: Brand new ESA and Clerk Sub in office- I have had to beg staff in other departments to help me input PARS, do Requisitions and support budget needs. The staff does not have the skill set and the learning curve is extremely steep. I am doing PARS, reqs. etc. SAFETY: Vacancies in critical Sped positions such as SEBT, Teacher. I am spending all day, every day supporting student behavior needs that are physically aggressive and safety concerns. BUDGET: Cannot get supplies purchased- no staff that know how to order items so I have had to buy all on P Card so it puts hours on my plate daily to get school open and ready. LACK OF SUPPORT FROM CENTRAL OFFICE: HR has ignored emails and phone calls, SPED staff have ignored emails and phone calls during crisis. I have never experienced it like this before. I have had to beg other staff in district to help me. — Amount of work I have to do at night: 3-4 hours a night since all day I am supporting student behavior. We are expected to provide information to the public from offices that have closed- example GATE- we were given a binder and a google link and were told now it’s our job to answer any and all GATE questions. No ELST so it’s my job to run ELAC and meetings. Having to complete budget exceptions for every little item after I have already submitted budgets which were already approved by my SSC, staff, parents, my area superintendent, the Finance and Planning office and the board of education, but still must submit exceptions forms for budgets I’ve already allocated so basically doing double work for no reason. I take issue with the fact that the wholesale cuts/changes were made completely indiscriminately. There was no analysis done by department, it was solely cuts across the board. This is bad management. Secondarily, HR is a debacle. They take so long to hire and rehire that by the time they are ready to hire someone that person has already taken a job in another district. We then hire the people that other districts didn’t want (the leftovers), if we can find someone at all. This is an issue that has plagued the district for years. There are many more comments spread throughout the surveys that point directly to the Supt. Marten regime leadership disaster. Virtually ALL these school site problems with support, especially in IT and HR, are directly related to the drastic staffing cuts by Marten. When you compare the these honest comments from hardworking administrative employees with the lies that Marten told the sparse audience at the 2017 State of the District address this past Tuesday. Marten is anything but “authentic”. Marten was especially inauthentic when she quoted Dr. Marten Luther King in her propaganda infused “State of the District” speech. Let’s remember what Supt. Cindy Marten taught us – If you want to be a Superintendent, be a superintendent for operational incompetence. Be a superintendent for financial mismanagement. Be a superintendent for jamming excessive work down administrators throats. Be a superintendent for charter school growth. At least it would be “Authentic”. One word, I think, about covers it all: PATHETIC!! Tuesday night. Someone should ask Cindy and board how many AC units are broke or in need of repair at schools. So much for cuts ‘FAR-AWAY’ from the classroom. Of course this is not over. The lack of money boogie man is lurking. He’s waiting for 2018. But it’ll only be a sub $70 million dollar deficit. More cuts comin’. Bet on it. Maybe all that approved bond money should not have been spent on fancy football stadia, just as has been mentioned by commentators on TV. Lost in Oz team Marten is so far lost they don’t even know it. No other school districts are having these kinds of troubles. Mismanagement of funds, creating unnecessary programs at the expense of our most basic needs. This is simply criminal behavior. The board of education is complicit in this criminal misconduct. Basic needs must come first custodial, clerical, I.T., maintenance workers. Any other priorities are misguided. Even teaching staff must be second to assuring our students have a safe, sanitary, well maintained environment FIRST!